Today we’re starting a new series here on the blog–to ask Oliver + S fans to share a bit about their favorite Oliver + S pattern – telling us why they like it, what they learned from it, and show off the multiple times they’ve made it! Our first guest is Gail (you may know her as supergail) who I “met” through the Oliver + S Flickr group. We both soon realized we live in the same town, so now we’re real life friends too! Here she is. Hello! I’m Gail, and I blog (mostly about Oliver + S clothing!) at probably actually. 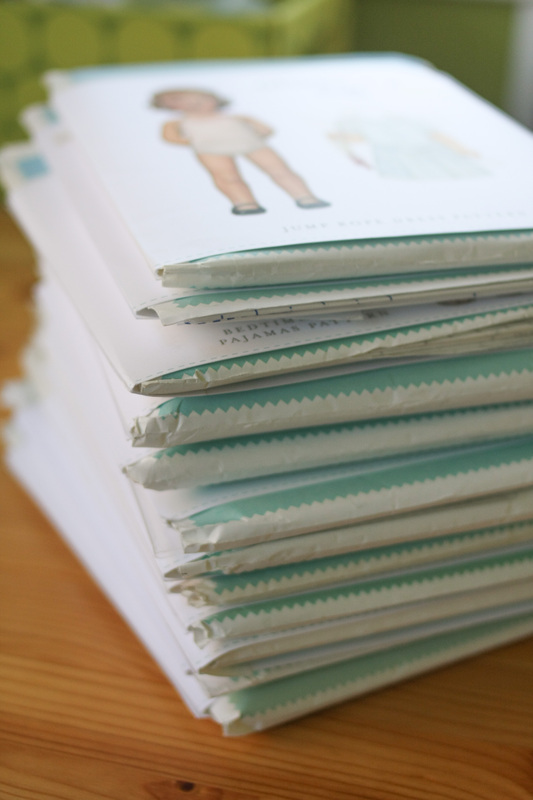 When Kristin asked me to write a post about my favorite Oliver + S pattern, I had to break it down a bit. I have so many favorites, and I’ve said it before, but it feels almost blasphemous to pick a favorite among such a fabulous collection of patterns! But all blasphemy aside, I knew immediately what I’d choose. 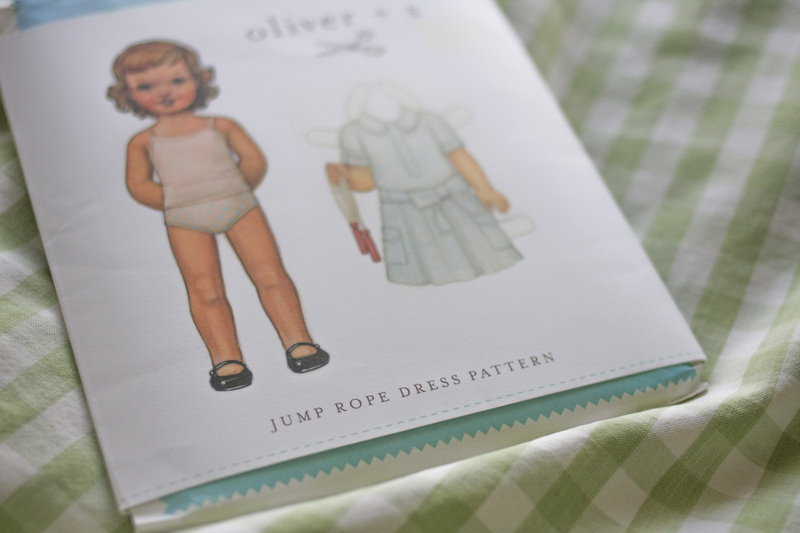 It’s not the pattern I’ve sewn the most, nor is it the one that gets the most wear, but the Jump Rope Dress is my favorite Oliver + S pattern purely in terms of style. It’s just a great looking dress, full of professional details you don’t often see in children’s clothing patterns. 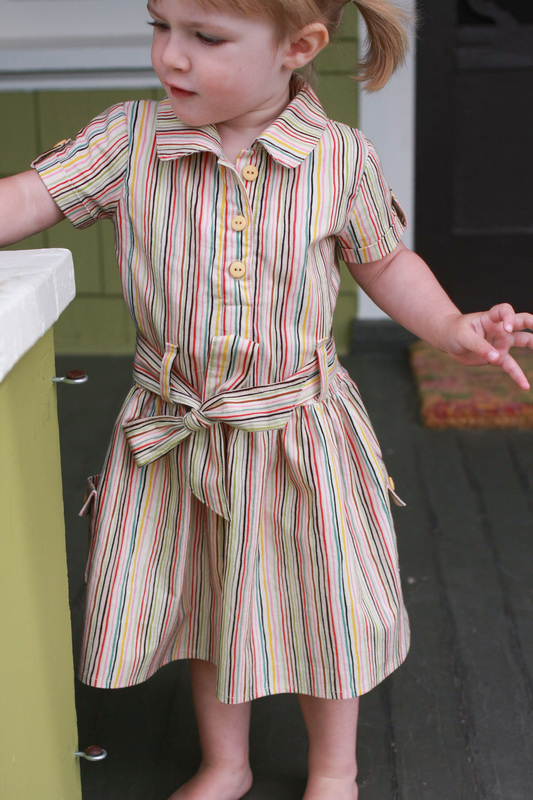 I fell in love with this dress in the Oliver + S Flickr pool long before I’d sewn a single Oliver + S garment. It was the first Oliver + S pattern I ever purchased. At the time I had no confidence in my ability to make a dress like this, but it inspired me keep sewing in hopes that someday I could. Heck, even the packaging is inspirational. Anyway, it took me seven months to work up the courage to make this dress! But once I did, I was even more in love. 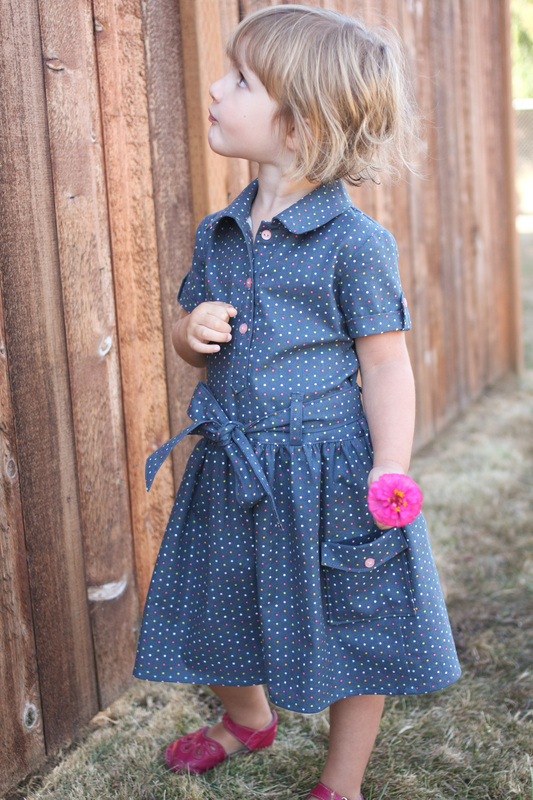 It’s been said that all Oliver + S patterns yield boutique-quality garments, and it’s especially true of this dress. When I finished my first Jump Rope Dress, I honestly couldn’t believe I’d made it. It has a three scissors rating, and it’s one of the more labor intensive patterns, for sure; those wonderful little details (placket, collar, sash, belt loops, sleeve tabs, pockets) take precision and time! But don’t be intimidated. As always, Liesl sees you through to the very end. It’s a great challenge, and you’ll feel so incredibly accomplished after finishing this dress. People will be in awe of your sewing prowess! You’ll be fielding compliments left and right! I’m telling you, this one is special. I’ve sewn three Jump Rope Dresses over the past 2+ years. The first was View A in colorful stripes. Then I gave View B a try. This time I used a gray chambray and added a little color inside the placket, on the pocket bindings, and with the top-stitching. The shoes really make the outfit, don’t you think? And for my most recent version, it was back to View A, in navy blue with colorful little polka-dots. And let’s talk about fabric, shall we? Before sewing my first Jump Rope Dress, I pored over each and every dress in the Flickr pool (and the Jump Rope Dress Sew-Along Flickr pool) trying to crack the code on the perfect Jump Rope fabric. My favorites turned out to be the small scale and tone-on-tone prints, subtle stripes, and almost solids, because they let the wonderful details of the dress shine through. I’d like to highlight a couple of my favorites from the Flickr pool…it’s such a wonderful source of inspiration and has fueled my love for Oliver + S patterns from the very beginning. 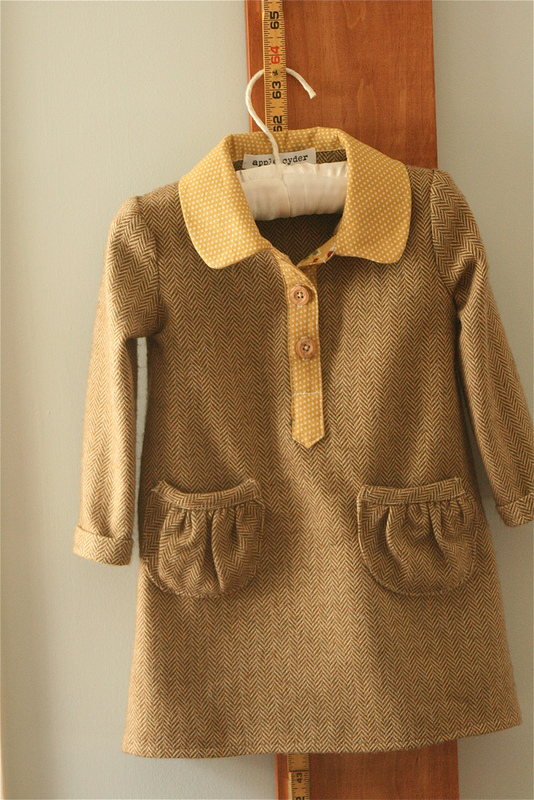 This is the version I first fell in love with – the tweed and the gold accents and the wooden buttons…such a perfect fall dress. And here’s another all-time favorite – icy blue voile with red accents, including rickrack around the collar and pockets. Divine. And don’t rule out the large prints! I have found some fabulous exceptions to the rule of small scale prints and subtlety, and this is another one of my favorites – beautiful Anna Maria Horner print in cozy flannel, contrast placket, no pockets – it just works. If you’ve always wanted to sew a Jump Rope Dress, don’t hesitate like I did. You can do it! And you’ll be so glad you did. Liesl will walk you through from start to finish, and if you need any extra assistance, Sew Mama Sew hosted a Jump Rope Dress Sew-Along where each step of the process is photographed and explained in even more detail. It’s an excellent resource to keep in mind if you get stuck or just need a few extra visuals. Thanks for having me here! I always love to talk about Oliver + S patterns to anyone who’ll listen. Gail, thank you so much for this wonderful post! 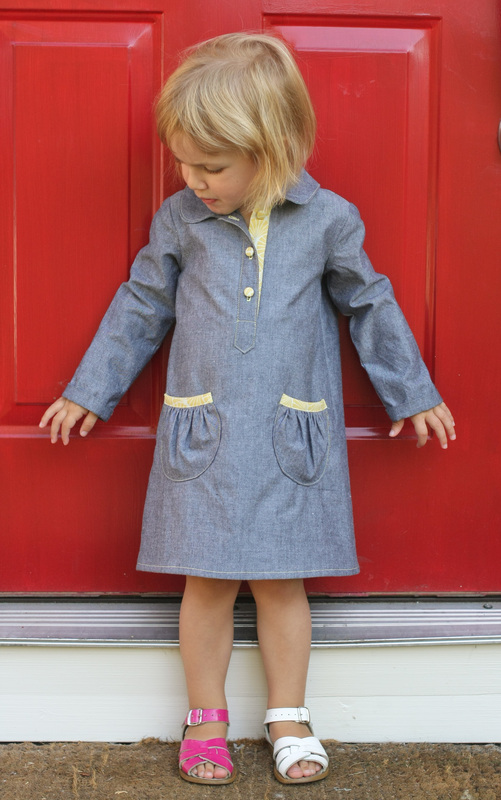 It’s so rewarding to see how much people love our patterns, and it’s even more wonderful to see what adorable clothes you sew for your children with them. I’m honored to be able to play a role like this and so thrilled that you took the time to write about the pattern. Thank you! Love this pattern too. I wish I had it in a larger size now that my daughter is growing up. my pleasure, liesl! thank you for for teaching me to sew with your wonderful patterns!! i look forward to following along with this series! The Jump Rope Dress Flikr link doesn’t work. I want to seeeee!! Andrea, we’re so sorry. We can’t seem to get that search link to work anymore. It’s odd. So we’ve just pulled that sentence from the post. There goes my Blog post, its my favourite pattern too. Don’t you have a different blog post you’re working on for us Nicole????? Ooh, I have to say, this is one of my favorites too! It’s just so classic and well done. Just wanted to say that I’m loving this new content. I’m a O&S junkie, I mean “groupie” as well 😉 and like Gail, enjoy any opportunity to read/discuss patterns. Thanks! 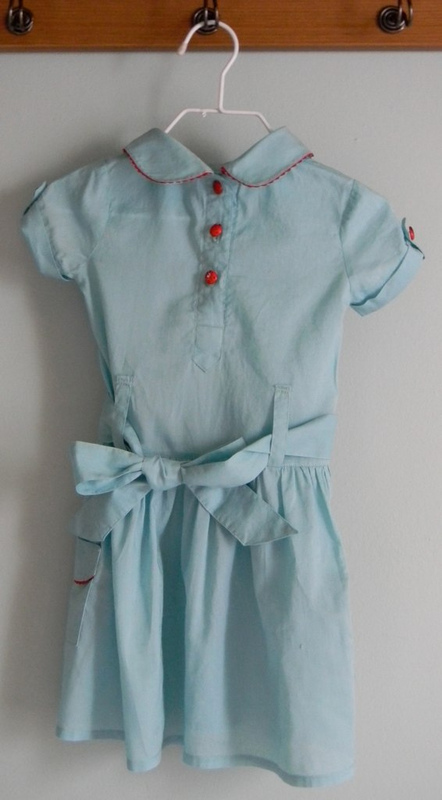 Hi – has the jump rope dress been successfully made in jersey fabric (for example, a nice stiff jersey like those made in Germany)? My mother (who taught me how to sew, and who has sewn wedding dresses etc and is amazing and certainly better than me) had the EXACT same reaction when she saw my daughter’s Jump Rope Dress! This pattern is beautiful and perfect. Thanks Liesl! I think this was just the motivation I need to finally get this pattern printed out and give it a try! I’ve been a bit intimidated by this one and the school days coat, so thanks for the great post Gail!